"He's a two-year-old. He changes his mind every five minutes." "When I first met Albert it was kind of hard for him to open up to a lot of guys. But now that we have a young team, a lot of players are looking up to him. A one time he used to throw his helmet all the time. Not anymore." "People are shocked when I say Albert is a nice guy. But it's the truth....The only problem Albert has had is he's too competitive. When he gets involved in a game, a competitiveness comes over him that's almost dangerous." "When he came to the opening, the kids' eyes lit up and widened like saucers. . .It's moments like that in which you see the real essence of Albert Belle, something most people don't see. He's such a kind man, yet at times it seems everybody wants a piece of him. That's hard for him. He doesn't want to be a superstar and all that goes with it. He just wants to be a phenomenal baseball player." "If you talk to him in person, you don't realize how mean he is. He's really a sweet guy. He's like a 12-year-old. But when he's on the field and 0 for 3, I don't reccommend that you talk to him. Sometimes he throws the cooler around. Sometimes he breaks phones in the clubhouse. There are cookies all over the place. This guy is so unbelieveable, he can go 3 for 3, go into his last at-bat and pop out, and he's still throwing cookies around." "Initially he screamed at all the media to get out of the dugout in language that was horrible. Two or three men left. They were frightened. I was the only one who stayed , because I was waiting to do my interview with Kenny Lofton. When I stayed he directed his tirade at me. I've been told by baseball people that their hands are tied on this because they know they will appeal any action taken....In light of the fact that Major League Baseball promised swift action after the World Series, I'm very disappointed. I was hoping that baseball would send a message that verbal abuse and intimidation is not to be tolerated in their workplace." 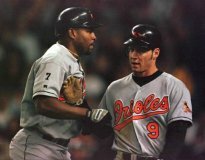 "I've talked about Albert Belle until I'm blue in the face. From the club persepctive, we pay him based on productivity and his talent...We've suspended him ourselves, we've sent him to the minor leagues for not running out balls, we've disciplined him, but at the same time Albert has grown into a productive player. We don't necessarily pay Albert to have a good image." "You don't understand,. He's crazy." "There's nobody in here who wants to produce more than he does. Nobody wants to win more. He's just very intense." "I know he hates me. If he needs that hate to succeed, it's fine by me. I always liked him. He was a good kid. He just had a hard time with the pressure." "When they coined the term tunnel vision, they had Albert in mind." "He had a problem, and he came to terms with it. That's in the past. Albert Belle is the most popular player in Cleveland. He does what we pay him to do." "Albert has his way of getting ready for games. If that's the way Albert does it, then I've got to respect it." "He should give the money back...I think that's exactly what the game doesn't need." "I'm not going to waste a spot on somebody who doesn't want to play"
"Everybody's streaky. Some people are streaky bad, the streaky hot. Guys like Albert, Sammy Sosa, and Mark McGwire, they get streaky hot hot." "Albert's a guy who's had a lot of different controversies in his career. He knows what's ahead. He seems to deal with things well. He seems to block that out and focus on the situation at hand." "I was quite taken aback when I spent some time with him, how articulate and candid he was about everything. He looked me right in the eye and said, 'I'll be the first one here and the last one to leave. I study film, I take my own notes and I play every day.'" "I really don't get involved in perceptions. We're all different,and that's what makes it interesting. Being judged on the things beyond what you do as a baseball player-sometimes I don't think thats necessarily right. Maybe you don't have the full story. When I come out here, I look at Albert as a teammate, I look at him as a baseball player. I look at how he comes to bat and how he approaches his job. He's someone you really appreciate when he's on your team. He's a 50-homer guy, a 140-rbi guy. He wants to play everyday. Who wouldn't want that? I have a lot of respect for him. Playing against him and watching how he goes about his job. I'm happy I'm his teammate." "Albert is capable of almost anything you can achieve as a hitter. I look at him as one of the best hitters of all time." "He came here and played every day. He was a warrior for us and I wish him the best, Albert is not as bad a guy as people think. We knew him differently. I wish him luck." "If a guy's playing a lot of games, like Albert, he sometimes runs out of gas. You're just worn down, so it doesn't look like your hustling. But Albert hustles, trust me." "The media definitely portrays Albert like that. Everything's always a negative, because there's only one side. To me, that's unfair. It's like they expect the worse -- and he's the exact opposite. He's a really good teammate all-around, and he gives 100 percent." "Albert threw some mail around -- and that was all anyone wrote about. That would be frustrating. If it were me, I wouldn't talk to the media, either." "When the guy gets hot, he's one of the toughest outs in the game." "Just look at his numbers, that's all you have to do.He goes out and plays hard. He's really different from how he's portrayed; you guys don't give him a chance. Everything is blown out of proportion." "He comes to play every day, and that's all that matters to me.He gets a bum rap in the press. He's done some things that weren't smart, but I think he's a great guy. You certainly can't argue with how he goes about his business on the field." "Albert has a very intense personality and that can be a double-edged sword. It contributes to his success, because he's so driven, but it's not something you can just turn on or off. No matter what, he is going to reach his potential as a player and he is never going to have to wonder if he could have been better, because he's done all he can. It's wound up affecting other parts of his life, but it's made him a Hall of Fame-caliber player." "He's been basically what we expected. . .He's been better defensively than I thought he would be. He has a good arm. There's much too much made of his defensive shortcomings. He just hasn't had the kind of [offensive] year he has had in the past." "I say, 'Hi.' He says, 'Hi.' I say, 'Nice job.' He says, 'Thanks.' He's not very communicative with many people." "He's played well for me. I've found him very approachable behind closed doors. Albert is Albert, you're not going to change him. I do like Albert. There are things he does I don't like." "When you have a guy who's as productive as he is and is willing to play every single inning of every game, you have to respect that. Clearly, he's a superstar who's headed to the Hall of Fame." "He gets criticized a lot for not talking to the media, but that's indicative of his indifference to how he's perceived and whether he's regarded as a superstar or popular. All he wants to do is play baseball. As a teammate, he's the best you can have." "The bubble-gum card doesn't lie. Albert Belle is something special." "You have to have inner drive when you get to this level, but he has something that's much deeper than a lot of players. In every arena, there's always a guy who looks different than anybody else. When he puts his game face on, don't mess with him. That's Albert Belle." "I know Albert as well as Albert will let me know him, and that's OK with me." "I like Albert. I think Albert is, if not the best, one of the best right-handed right fielders in the game today. Over the years in Cleveland, Albert and I developed a certain level, and amount, of trust and respect. And that's what I've seen since I've been here." "It's been my experience in Cleveland that Albert worked very hard on his defense. He cared about it. I've watched him here in camp already and he's showing the same work ethic. He's improved greatly in the outfield because of his work ethic." "Albert is Albert. . . He's an RBI monster, a run producer who absolutely legitimizes any lineup he's in." "It's sad, because he's got a lot of baseball left in him. He's a competitor." "Despite what people think of him, I had a tremendous relationship with Albert. . .All I know is he played hard for me and played every day. If his numbers justify that, I don't see why not. . .Everybody in the Hall of Fame is not a saint, anyway." "Albert loves this game. He's been playing his whole life. . .You want to go out on your own terms, and when you don't, it's real heartbreaking. Your heart goes out to him." "I've seen him get hit with pitches on his hands and elbows and go out there and play. . .Even when probably another player wouldn't be able to play, he just goes out there and plays." "I had a lot of respect for him before he came here (to the Orioles) and I have even more respect for him now." "He always wanted to be the best. His intensity at the plate was almost unparalleled. Even to see him at the end, trying to battle the injury, showed how much heart and commitment he has. He just doesn't give up. That's a quality you admire." "I don't care what people said about his attitude and about what he did off the field. . .A lot of that had to do with the way he prepared for the game. He was very intense about getting ready to play. But he was an outstanding player. That's what I care about." "Some people claim he's not great in the clubhouse and that he's selfish. . .To me, that's not correct. He was a hard-nosed player, and in many ways he was a real leader. A lot of people didn't see the good side of Albert." "All he wanted was respect." "I don't think he appreciated getting booed all the time and having all those things said about him. . .I mean, this was one of the big stars of the game, but he wasn't flamboyant. This is a well-rounded brother. He just wasn't a guy that wanted to be in the papers." "When he had that problem with the fan in college, he got absolutely torn apart. . .And after he came up to Cleveland, they hammered him again when he had another run-in. . .It just totally put the man against the media, because a lot of writers, all they wanted was to find out what was wrong with Albert." "Albert is a brilliant guy, and he's a lot more complicated than he's been portrayed. . .He was a perfectionist in a game which is built upon imperfection. When I first got in touch with Albert in 1990, he was obviously a terrific talent, but it was clear that he couldn't deal with the frustration of baseball." "I don't think he was ready to leave the game. . .I saw him a few weeks before spring training, and he was more exhausted about the effort involved with this continuous pressure from the media to get an answer at any cost than he was about the game itself."